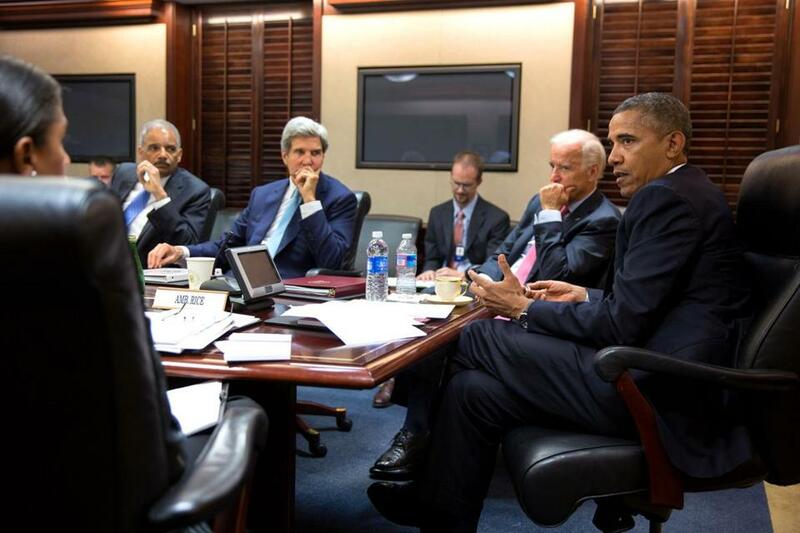 President Obama met with his national security staff to discuss the Syria crisis in the Situation Room of the White House on Friday. WASHINGTON — President Obama built his career opposing the Iraq War. Secretary of State John Kerry built his opposing the Vietnam War after he served in it. Defense Secretary Chuck Hagel, who still carries shrapnel in his chest from Vietnam battles, has long held a force-as-a-last-resort posture. And then there is Vice President Joe Biden who once talked of impeaching President Bush if he moved to attack Iran without gaining congressional approval. As the administration Friday laid out the rationale for striking Syria, much of the president’s foreign policy team consists of people who have, over the years, expressed deep misgivings about using American military power unless and until no other option is available. Now they are the ones – in private calls with members of Congress, and in public statements – trying to make the case for limited military strikes on Syria as punishment for President Bashir Assad’s alleged use of chemical weapons. The situation is drawing comparisons to their past positions, as well as forcing them to reconcile longstanding reluctance to use military weapons with their desire now to use an attack to support the humanitarian cause of preventing the use of chemical weapons. “You have a lot of people who are predisposed not to take military action but now find themselves in a sense boxed in both by what Assad has done but by their own words and convictions,” said Daniel Kurtzer, a career diplomat who was ambassador to Egypt under President Clinton and ambassador to Israel under President George W. Bush. President Obama and Secretary of State John Kerry forcefully made the case that the Syrian government deliberately used poison gas to kill civilians. Kerry, who rose to early fame as an antiwar protester, increasingly has become the go-to public face for the administration on making the case for Syria strikes. On Friday, it was he who went to the Treaty Room at the State Department and delivered lengthy and impassioned remarks outlining a case for battle. As he did so, he made it clear that intelligence officials had learned from Iraq, and that any military action would be brief, with no troops on the ground, he said. 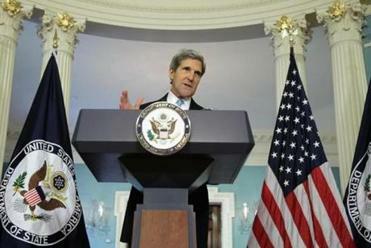 Much of Kerry’s seven-month tenure as secretary of state has been shaped by the Syrian conflict. His first trip abroad was dominated by discussions on helping arm the Syrian rebels to help them in their fight against Assad. Earlier this month, he worked with Russia to schedule a Syrian peace conference in Geneva. Kerry also has a history with Assad. When he was chairman of the Senate Committee on Foreign Relations, he led a delegation to Syria. In Feburary 2009, he and his wife, Teresa, dined with Assad and his wife, a scene captured in a photo that has received wide distribution on social media this week. Kerry’s posture is matched by Hagel, a fellow veteran who voted to authorize the Iraq War but later became one of its fiercest opponents. The former Nebraska senator’s opposition and frequent criticism of the Bush administration earned him scorn from his fellow Republicans. “We have moved assets in place to be able to fulfill and comply with whatever option the president wishes to take,” Hagel told BBC News last week during a trip to Brunei. General Martin E. Dempsey, chairman of the Joint Chiefs of Staff, has also recently issued blunt warnings about the risk of engaging with Syria, and he has argued that the country needs to heed the lessons from Iraq. Susan Rice, national security adviser, and Samantha Power, United Nations ambassador, appear to have been early advocates for responding to the latest attacks. His opposition to the war was a major factor in helping him win the 2008 Democratic presidential nomination. The former constitutional law professor also was critical of the idea of the president using force without getting authorization from Congress. “The president does not have power under the Constitution to unilaterally authorize a military attack in a situation that does not involve stopping an actual or imminent threat to the nation,” Obama wrote in response to questions from the Globe when he was running for president in 2007. About the same time, Biden was just as critical, engaging in a debate about whether President Bush should strike Iran because of its nuclear weapons development. Those statements have made it harder for the administration to move ahead without gaining approval from Congress. The White House has said repeatedly that it has been consulting with top congressional leaders, but it has stopped short of saying whether it would seek approval before moving forward. It also has not explained its legal rationale for launching military strikes without congressional approval, saying it is premature until Obama decides to launch strikes. Obama has spent much of his presidency in a commander-in-chief role. He has overseen the surge in forces in Afghanistan. He reluctantly engaged in the conflict in Libya, joining a coalition of NATO and Arab allies in efforts that toppled Moammar Khadafy.